In 2010, I worked with Omnigon to design and develop a full screen experience for The Radio City Rockettes that leveraged an amazing library of high resolution photographs and featured videos in a way that felt more like television than a web site. The Radio City Rockettes had given great thought to who they were as an iconic brand, and the unique qualities and experiences they brought to their shows in New York City performance at Radio City Music Hall. The objective for the new Rockettes website was to create an online destination for the Rockettes that went beyond the elements that are currently included within the Radio City Christmas Spectacular site. The overarching goals were to develop The Rockettes brand identity, diversify the consumer base, and develop an engaging online and mobile presence that exemplified The Rockettes as exciting and genuine personalities. The Rocketts had a strong community awareness, but yet they needed a platform to better engage with their audience. 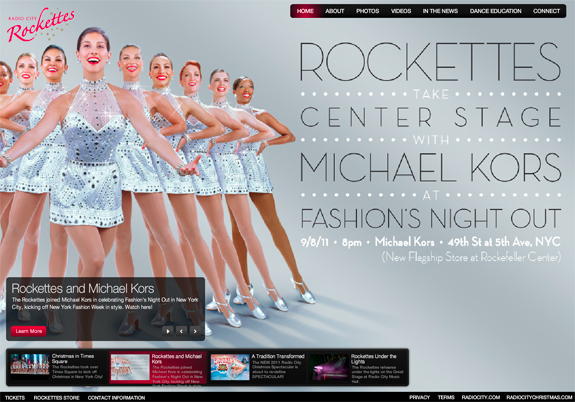 Our overall focus was to develop an online presence that allowed consumers to learn more about The Rockettes, their personalities, backgrounds, and the process of becoming a Rockette. Part of this approach was to integrate timely and relevant content, such as behind the scenes videos and photo galleries, that engaged users. Overall, the Omnigon design and technical teams created a stunning visual representation of what the Rockettes stand for, while integrating the technology required to manage this content-intensive site on a daily basis. Omnigon created a jaw-dropping full screen experience that allowed us to leverage the library of high resolution photographs and feature videos in a way that feels more like television to a user than a web site. The visual system also includes a non-conventional ad placement that tightly integrates with the Rockettes brand and the over screen design. This allows partners to most closely align their brands with the Rockettes and create a much higher level of visibility. The entire home screen serves as a dynamic lead (“DL”) with a pagination mechanism that allows site visitors to travel through the content in a completely organic and fully immersive way. A set of thumbnails/descriptions of the DL features sits below the device controls so that visitors can see the next feature before it appears on screen. This entire experience needed to be integrated with a java-based content management system to allow for non-technical staff members to be able to manage the site’s content. This development initiative required a fair amount of custom development to allow for the site’s interactive components, many of which were developed in Flash/Flex, and truly showcased Omnigon’s technical strengths in systems integration and custom software development. Rockettes.com received a 2010 Interactive Media Award (IMA) for Outstanding Achievement.